Young Carl Schels in the wilderness. When the young, unmarried Carl Schels lost his job working for Chicago Western Electric in 1930, the prospects for the future didn’t look good. A Bavarian immigrant with a strong accent and only a high school education, he had few choices. He could stand in long lines with the hundreds of other unemployed men, hoping to find some menial work. He could depend on the charity of others and line up at the soup kitchens, or depend on the generosity of relatives. Schels chose none of those. Instead, he packed all his belongings in a Model-T he had purchased for $20, and drove to the Wisconsin North Woods. As Schels recounted in his autobiography, “A Trapper’s Legacy – The Tales of a Twentieth Century Trapper”, his dream was to make a living from the land somewhere in the cutover of northern Wisconsin. There, thousands of acres stripped of big timber a generation before lay abandoned to wildfire and neglect by the lumber companies. Possessing no logging, farming, or woods skills, Schels was the typical “greenhorn.” But what Schels lacked in skill he more than made up for with ambition and a willingness to work hard. He found his way to north central Wisconsin, and took a job working on the Wolf River Mink and Fur Farm, clearing land with handtools, cutting firewood and mixing barrels of mink feed. He worked only for room and board - oatmeal for breakfast every day and an old steel cot in the attic to sleep on. Though he knew he wasn’t being treated fairly he stuck it out, too proud to go home. The hard work made him stronger and more independent. After two years at the mink farm Schels knew it was time to move on. The winter of 1933 would be the first on his own, and when he really began to live from the land. Using money borrowed from his uncle back in Chicago for winter supplies, Schels purchased a few foothold traps from the Montgomery Ward catalog. At the time, trapping was one of the few ways to earn hard cash in the north. According to Schels, at that time weasels brought up to 50 cents each, muskrats averaged 65 cents, and mink might fetch as much as $7.00. Schels wrote that he knew practically nothing about trapping, but he learned quickly and by spring he had taken 18 muskrats, a few weasels, and two mink. The fur was shipped to Montgomery Ward for sale. With the hard cash made from fur trapping he ordered a Remington .25-20 from the Ward’s catalog, his first real gun. “This was always considered a violators gun,” wrote Schels. “It had all the firepower needed but the main thing was it didn’t make a lot of noise." Much of Schels’ fur trapping activity was illegal. Due to low numbers of furbearers, trapping was highly regulated at the time. However, it was a depression era economy in north Wisconsin in the early 30’s. Times were hard, and people did what they could to earn hard cash or put food on the table, legal or illegal. By his second winter of trapping Schels had acquired many more traps, including the larger No. 4 Newhouse, a trap big enough for beaver. Schels trapping skills developed quickly, but skill in avoiding the law lagged behind. “I never saw them but they saw me,” wrote Schels. It was probably another outlaw trapper who reported Schels to the game warden. Eventually he got caught with illegal muskrat pelts and spent almost a month in the Oneida County jail as a result. Winter beaver trapping was strictly illegal in those days, but it was the beaver pelts that could really bring in some hard cash, even more than mink. Beaver trapping was a game of cat and mouse between the trapper and the conservation warden, but Schels soon learned how to play it expertly. Outlaws like Schels trapped deep in the forest, far from roads and towns, and stayed out in the woods for weeks at a time. In 1937 Schels’ quest for beaver fur was taken to a new level. 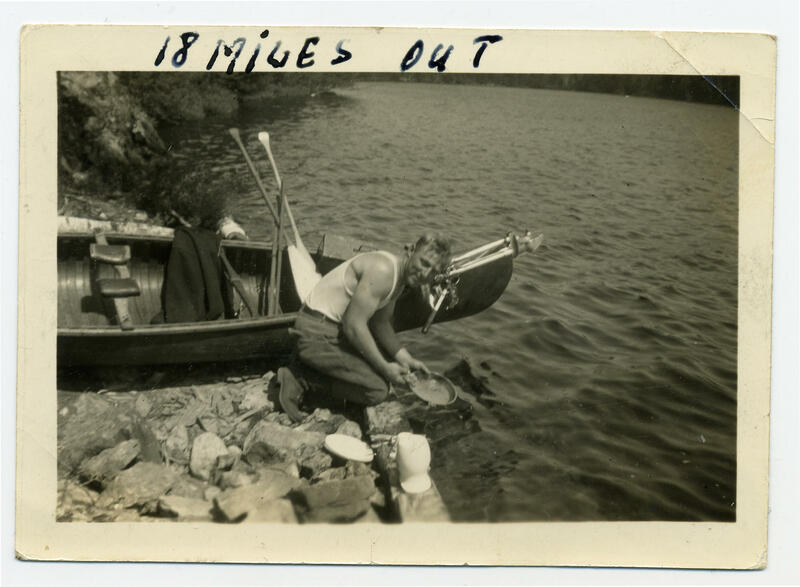 He headed to northern Minnesota to establish a logging camp on the Gunflint trail. But the venture wasn’t profitable, leaving Schels bankrupt and alone in the northern Minnesota wilderness. Schels may have given up if it hadn’t been for his love of trapping beaver. The forest owner also was an outlaw beaver trapper, and he took Schels deep into the wilderness on a winter trapping expedition. It was an experience that almost killed him, several times. Schels had come a long way since 1930, but trapping in the unforgiving Superior country was a new game. The trappers packed 50 miles into the wilderness, each carrying an 80-lb. pack. Shortly after making a base camp, Schels feet and legs became painfully inflamed, the result of boots laced too tight, and he was unable to walk for days. To compound the problem he also developed snow blindness, with painful, raw eyes. Schels partner was not sympathetic. But retreat was not in Schels nature. Instead, he struck out on his own, an incredible decision since he had no map, and had never trapped the country before. He made his own camp, a thin tent held against a natural rock wall that reflected heat, with balsam boughs to cover the ground. Schels recovered and trapped many beaver from his camp. But when it came time to leave the wilderness with his beaver pelts, Schels again faced a life or death situation – he was 50 miles from his cabin with only a memory of a map that showed the canoe route he needed to find. Temperatures dropped to 30 below and colder as he walked in the direction he felt would take him home. Approaching the outlet of a lake he fell through the ice, snowshoes on his feet and heavy pack on his back. Luckily the water was shallow and he was able to chop his way to shore with a hatchet. A quickly made fire and some dry clothes saved his life. For the next two days he fought hunger, extreme cold, and weariness. Near total collapse, Schels hit the main road at about midnight of the fourth day of travel. Schels returned to Wisconsin and eventually settled near Eagle River, married, and built a successful lumber business. But he continued to trap throughout his life, until he died in 1996 at the age of 90. History Afield essays are adapted from the books History Afield and On the Hunt, written by Bob Willging and published by Wisconsin Historical Society Press.